Service: Nurse, Dale U.S. General Hospital, 4/65-8/65. When the war opened I was at my home in Brattleboro, Vt., and becoming at once intensely interested and eager, I longed with my whole heart to enter the field as a nurse. Two obstacles barred the way to an immediate realization of my desire, -- these were my good father's consent, and my failure to meet the requirement of age. With the intensity of youth, I used often to exclaim, Oh! if only I were a man, or forty years old! As time went on I made various attempts to enter the service, but not until after the establishment of the United States Hospitals in the several States was I successful in obtaining an appointment. My actual term of service covered the short space of four months, from April to August in the year 1865, at Dale, United States Hospital, Worcester, Mass. But although few in number the weeks were full of work and incident and I felt very grateful that I was permitted to have the honor and privilege of lending a hand in my beloved country's need. Source: Mary A. Gardner Holland, Our Army Nurses. Interesting Sketches, Addresses, and Photographs Of nearly One Hundred of the Noble Women who Served in Hospitals and on Battlefields during Out Civil War, B. Wilkins & Co., Publishers, Boston, MA, 1895, pp. 568-569. 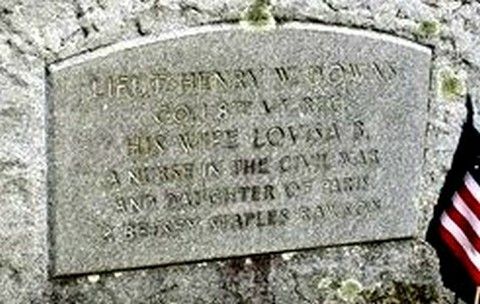 Webmaster's Note: Lovisa Betsy Rawson was the daughter of Paris and Betsey (Staples) Dawson, of Dover, Vermont. 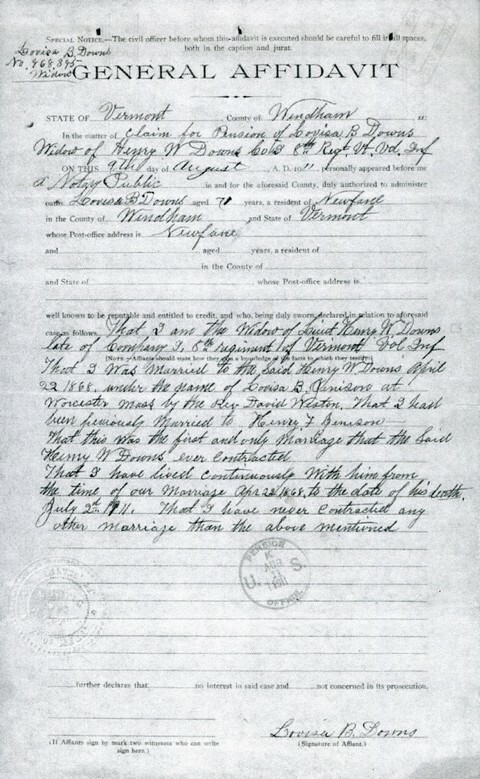 She married, 1st, Francis H. Jennison in 1861. 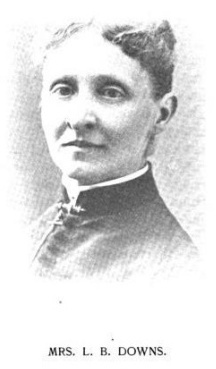 Jennison served in the 16th Vermont, and later in the 2nd Mass. Heavy Artillery; he died of disease while in the latter unit, in Plymouth, NC, 28 Feb 1864. They had no children. After the war, she married Henry W. Downs, 8th Vermont, a Medal of Honor recipient. 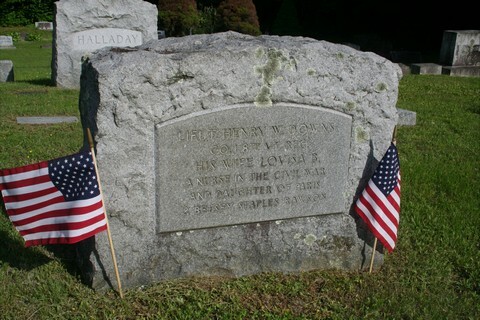 Henry died and is buried in Dayton National Cemetery. Lovisa is buried in Woodlawn Cemetery, Newfane. Please also see a history of Dale U.S. General Hospital, Worcester, MA.